Nominated for Sisterhood of the World Award!! Gail from Snapshots in cursive nominated me for the Sisterhood of the World award. And very grateful, as well! A- Singing hymns, and Scripture songs always helps. Also, talking to my brother! A- It used to be bread, any kind. Now that I’m gluten free, I’m really beginning to enjoy fresh vegetables more. A- Read a novel, or color a picture. A- So, so much! My house is finally quiet after many years, and I just sit, soaking it in. A- No, I don’t intentionally hurt people. Sometimes I do, because I often speak before I think. Trying to work on that bad habit. A- No, not really. I know humanity is fallen, from Adam and Eve sinning. Our only hope is through Jesus Christ, and His atoning blood. A- To have an air conditioned vehicle again! I live in Florida, and I melt every time I have to drive. A- A sinner saved by grace. Love my girls, and family. A- Too often, by sleeping. A- Bad grammar. When I was in 8th grade, I red lined all my boyfriend’s love letters, and sent them back to him for correction. What a word snob! 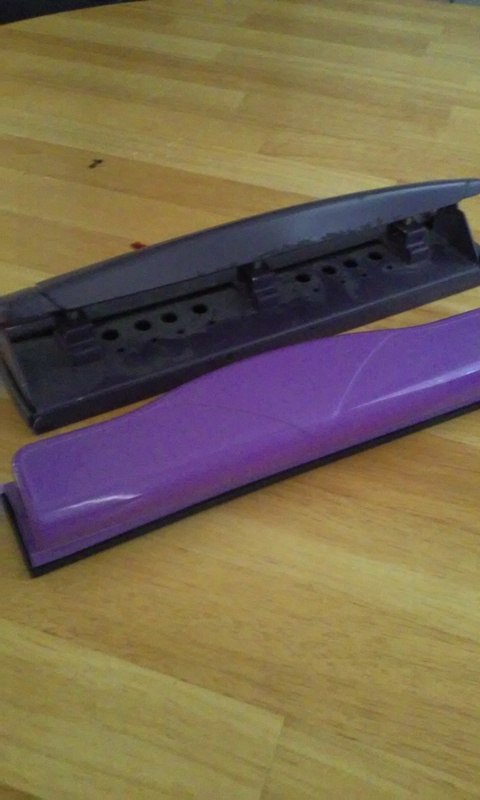 Yep, that’s 2 3-hole purple paper punches. When I was teaching, I used them ALL the time. And why did I have 2 in the first place? I’m sure you can figure it out. I was always losing one, using the other, until I lost it, and having to unearth the one. Um hmmmm… Yes, I’ve always lived in my own special brand of chaos, ever since I moved outta my Mama’s house. And I haven’t taught in, um… how many years now? Several. Okay, 6 and 1/2 years, if you ‘re gonna be picky about it. Because, that’s real life, ya know. You don’t need something till you get rid of it. Yeah, yeah, I haven’t needed it in 6 years, so I might be safe. But, I’m warning you right now, if I need it within the next 6 months, it’s coming outta YOUR pay, when I have to buy another one. Alrighty then, onward to the next item. 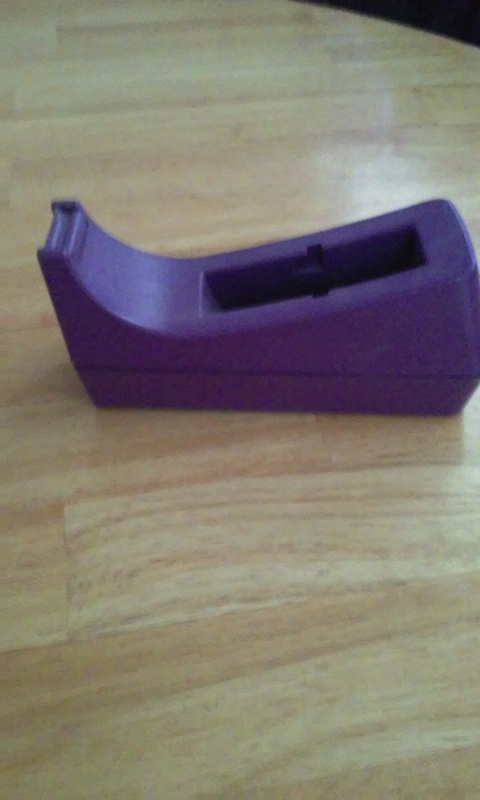 A tape dispenser. I know what you’re gonna say. And no, I haven’t used it in 6 years either. As a matter of fact, I don’t think anyone can use it, because the little rod that holds the tape in there is missing. You want me to what??? 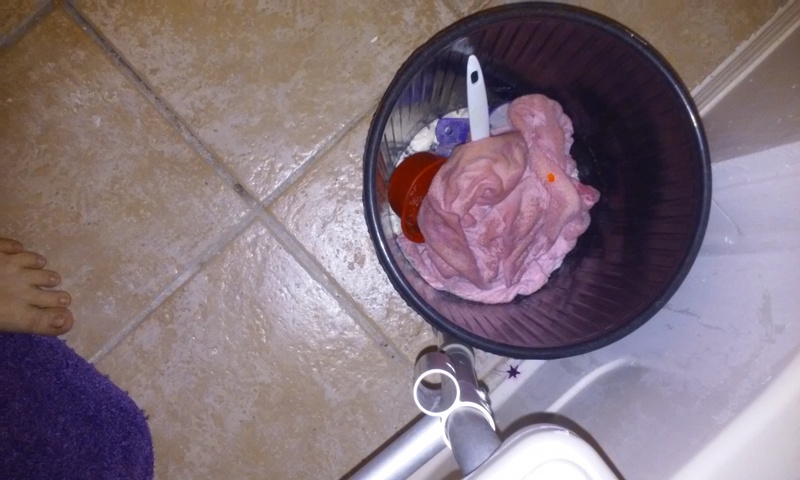 (gasps in horror) throw it away??? But, I’ll be killing Mother Earth, adding to the landfill! Surely someone could use it for something… Maybe I can give it to my Sister for Christmas, as a paperweight??? Decisions, decisions. Those of you without slob brains, probably don’t know what I’m talking about. Fine. 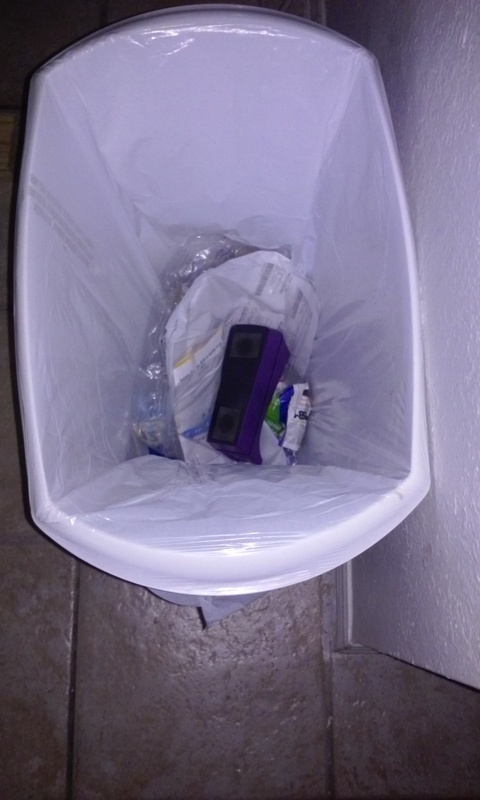 There, it’s in the trash. May I please get out of the corner, and take off my “I am a hoarder” dunce cap? I’m in such agony right now, from parting with my treasures… I don’t know how much more of this I can stand. “It’s only getting rid of useless junk”, you say. Ouch! You’ve just stabbed me in the heart! “De-clutter”, they said. ” It’ll be fun”, they said. Yeah, right, like a root canal. See all those boxes? They have been that way since Brother and I switched rooms. I don’t know when that was, I can’t remember everything! At least a coupla months. The chaos looks pretty organized to me. 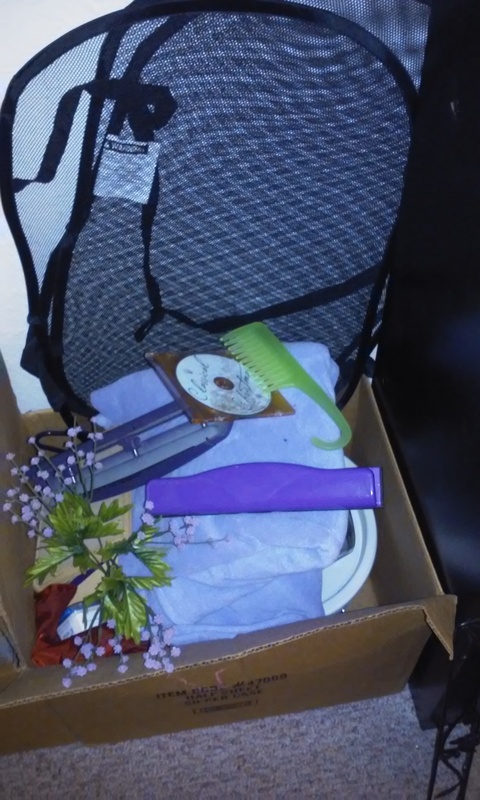 In boxes, instead of just randomly thrown around is organized, right?? Right?? Because boxes are containers, ya know. 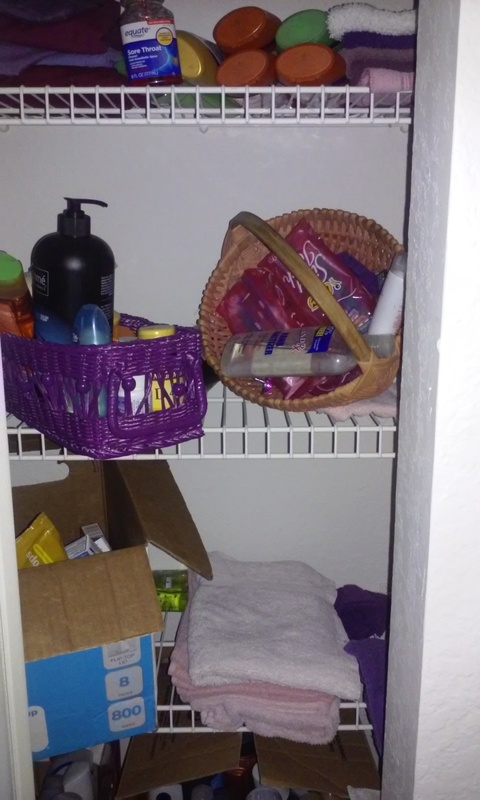 And using containers means you’re organized. Yep, I’m going with that. We’ll just ask the professionals. I gotta question for you ladies. 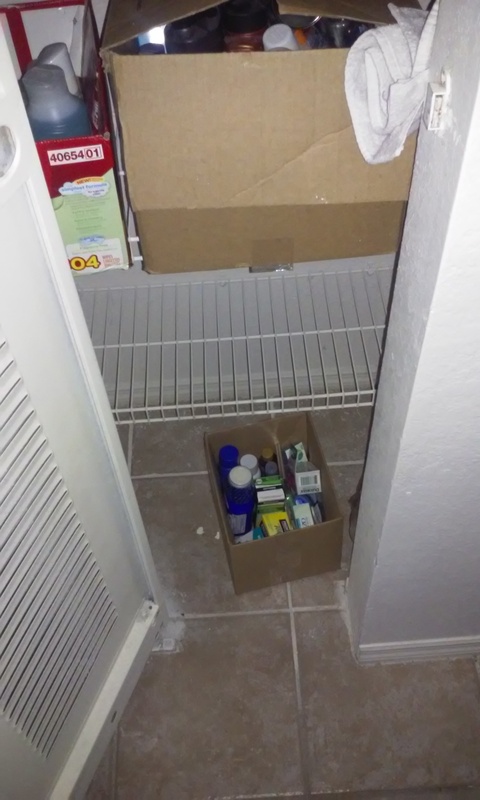 Things in containers are organized right? So long as the containers aren’t overflowing? Could you say that again? Oh, cardboard boxes are NOT the preferred containers? But they are free! No, Kristen, I don’t have a Container Store frequent shopper account. Could you use yours, and give me a friend’s discount?? Oh, you mean to be truly organized I have to know what I have, and it all has to be useful, not hoarded?? Huh, whaddaya know about that. How’s that? May I please have a gold star on my chore chart? So sorry I didn’t get after photos of the Scooter Storage Space. 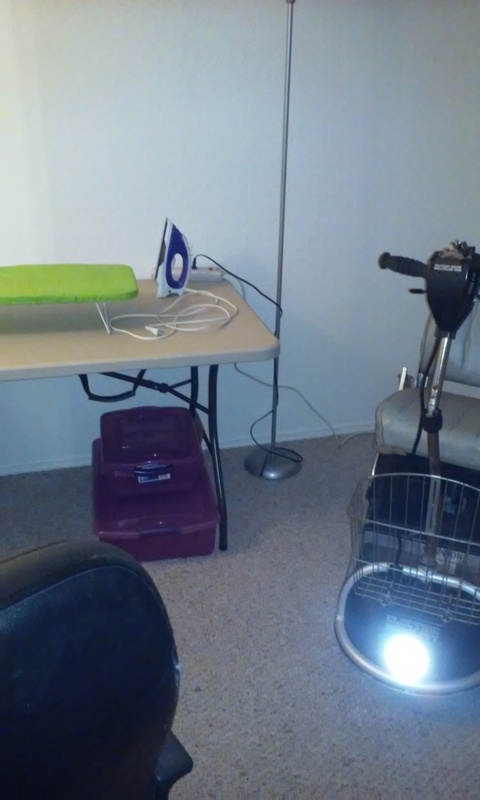 I did get pix after it was transformed into my new…. 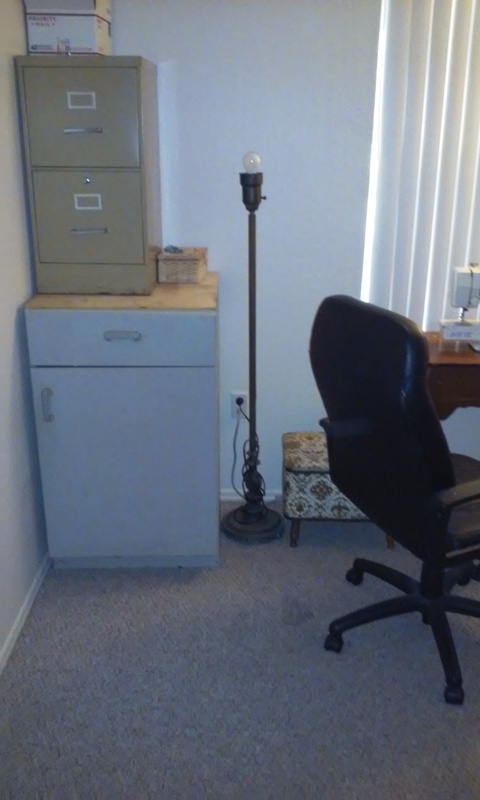 I know the lamp is ugly, but it’s free! And provides light! The first feature being the most important to me! 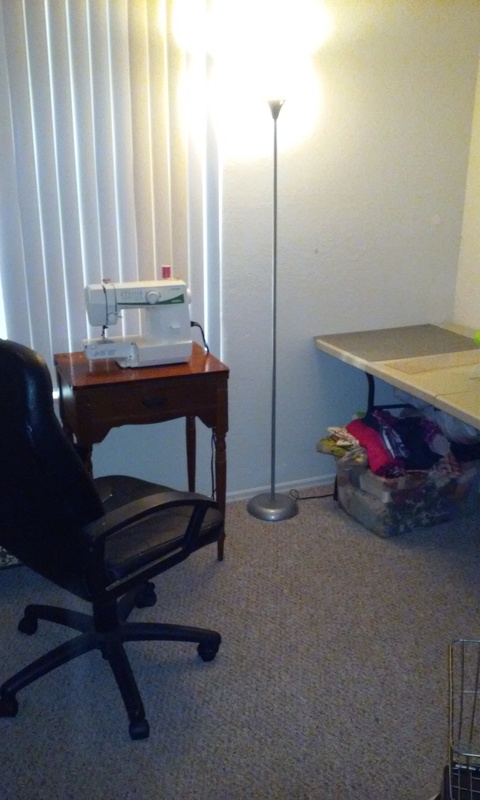 I hope putting the sewing machine smack dab in front of the window helps me see better. Seemed to work in the other room. And look! There’s even room left for the scooter! WE can all just get along! 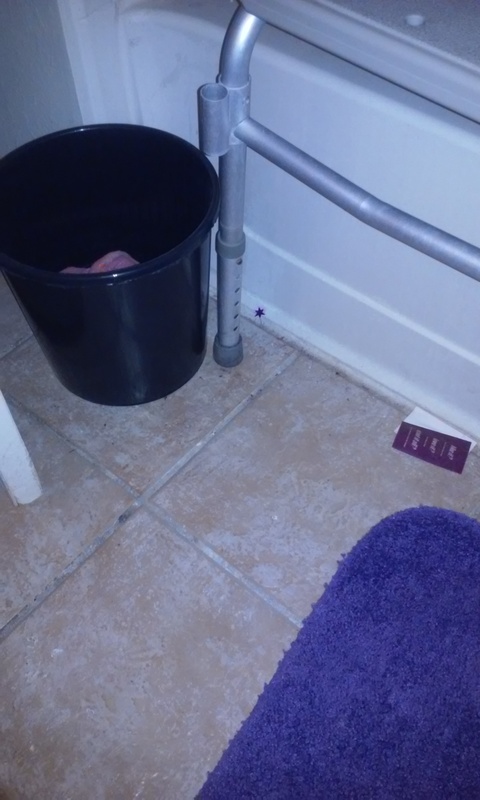 See those pretty, purple containers under the table? 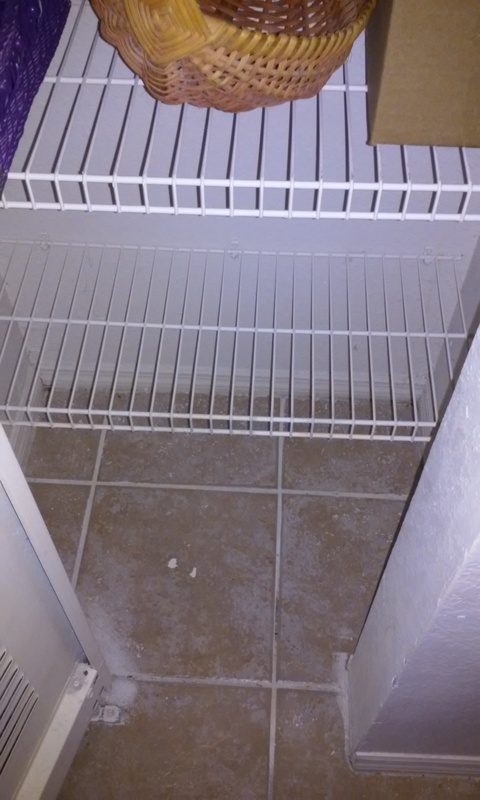 Com-pletely empty. What a shame! Well, just cuz I got ’em, don’t mean I’ll use ’em. I do like looking at them, though! So purdy! Maybe someday, I’ll utilize them properly. We can always hope! “Sew”, now I’m set up to begin quilting again. Ready, set, sew! I have joined all kinds of Linky Parties lately. 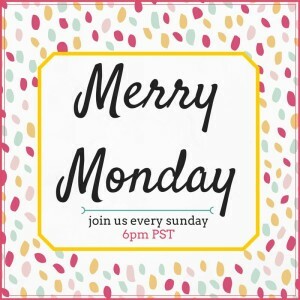 It’s a wonderful way to meet other bloggers, and see what they have to say! Then, they get to meet me too! Win/win! 3rd, Shirley from Intelligent Domestication. 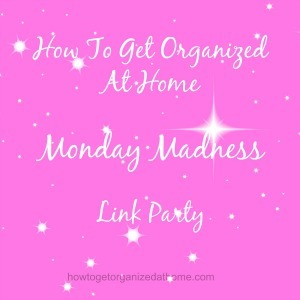 4th, is Monday Madness, with How to Get Organized at Home. It takes me a while to go through each one, because I want to read ALL the links! I read fast, but oh my! Some of the parties have 300 links! That’s a lot of reading!! Good thing I have snacks! I don’t know what betide means, or even if its a real word. But I don’t care. I like the sound of it, so here it stays. 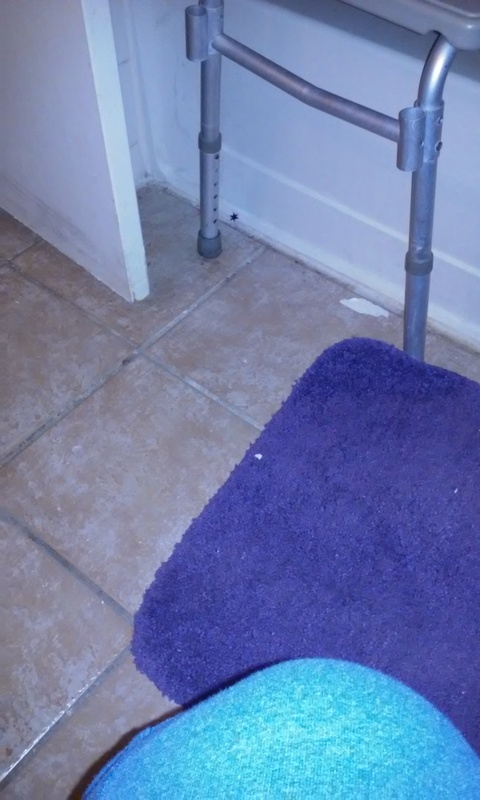 Now, I see it every time I go into the bathroom. I’ve even tripped over it once or twice. but have I bothered to do anything about it? Well, what do you think? Since I’m writing a post about it, you’d be right in assuming it’s still there, still in the way. I’m not even positive what’s in there. I peeked in once, but didn’t feel like pursuing it. I’m kinda scared to fully investigate. 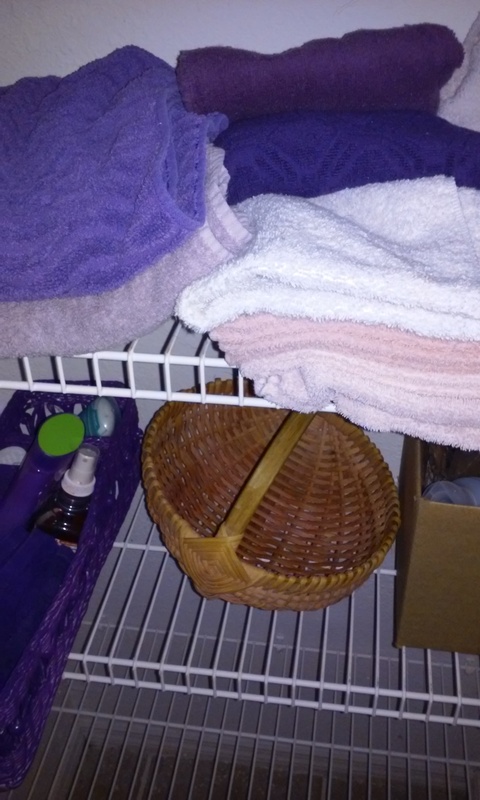 One thing in there is a towel, so I’m thinking by now, it’s gotta be stinky and covered with mildew. Eeeww! If PP has gotten along this long without that towel, I’m quite sure she’ll survive without it. I’ve had Felicia, since I was in 9th grade. I love her; I’m 54 years old, and haven’t played her in 6 or 7 years. I no longer have the breath. But I just couldn’t let her go. I considered selling her. That felt too much like selling a child, not done. I considered giving her away. Nope, just could not do it. 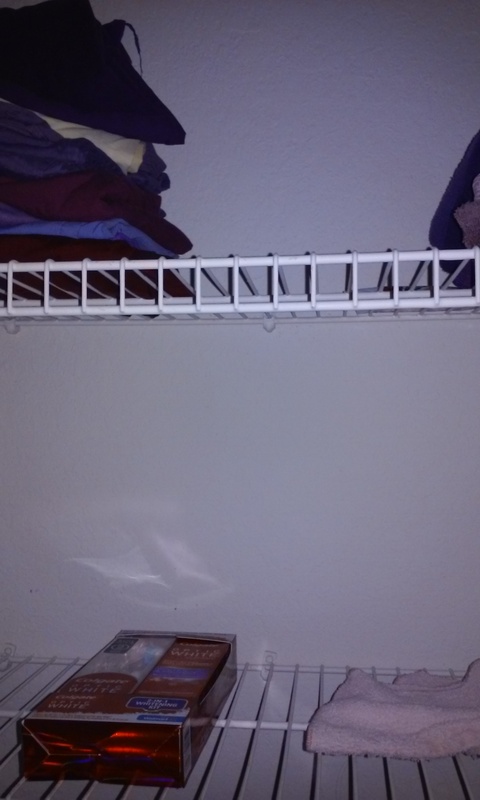 So, she sat in my closet. And I moved several times, okay 4, if ya want to be picky, since I decided I needed to release her. 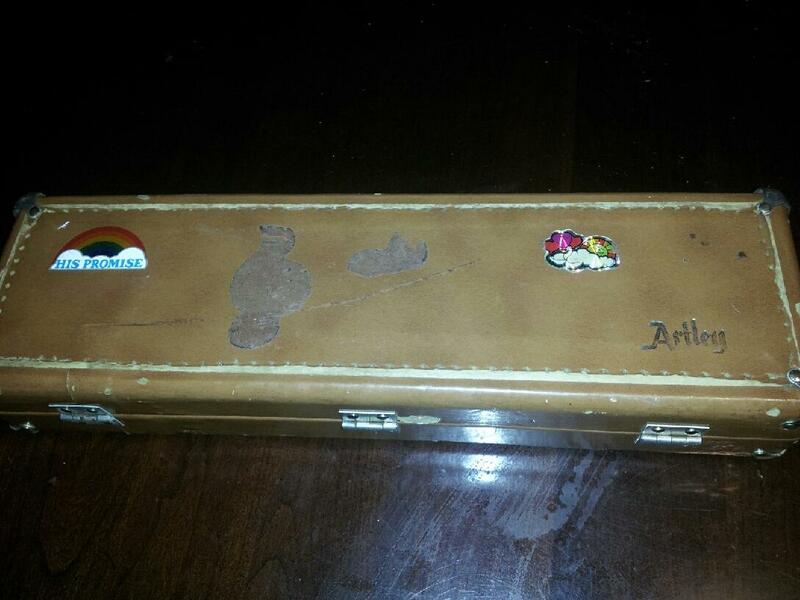 But still, she was with me, in her pretty light brown case, with the 70’s stickers on it. She’s an Artley! Real silver! She was MINE. Then, my niece started playing the flute. Nice, maybe we can play a duet. Ha ha ha ha. (Barely even have the breath to laugh that hard!) Suddenly, her flute developed a problem. She needed a replacement flute. Sis asked if she could borrow Felicia. Sure, she can “borrow” her, understanding that I want her back! Ah-hem. What happened to de-cluttering? A little voice whispered in my ear. I brushed it off, refusing to even dignify that question with an answer. Now, my niece’s birthday is coming up; and I have no present for her. Except, she already has my flute, that she needs, and is using. 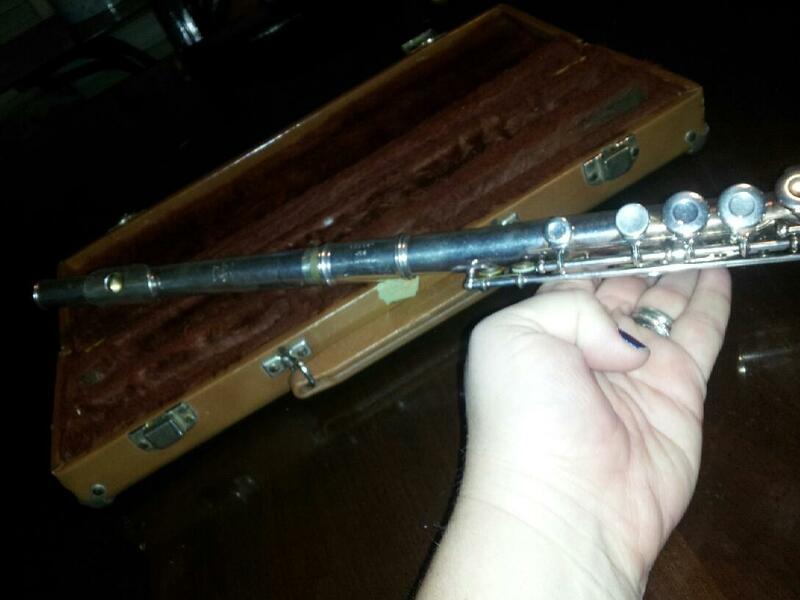 And that I haven’t even had out of the case in more than 4 years…… So, fine, she can keep the flute, I thought grudgingly. After stewing on it a few days, I realized, she will get more use and pleasure out of it, than I ever will again. On her birthday, I called Kristen and told her that Felicia was her gift. She was thrilled! And my Grinch heart grew 5 sizes.